Digital Signage Software: Is Customer Experience that Important? “ Customer Experience has emerged as the single most important aspect in achieving success for companies across all industries ” (Pepper and Rogers) . Take a look at companies like Amazon, Apple and Starbucks. They all offer fantastic products, as well as unmatched customer experiences in their respective industries! For example, when you browse through Amazon you would search for the product that most interests you. For the sake of discussion let’s pretend you are looking for a book. When you search for that book you desire, you get a list of vendors who sell that book, at their published prices. Not only do you get the list of vendors who offer your desired book and their respective costs, but you also can read through reviews on each one of them posted by previous customers. As you interact with amazon, you’re being shown other products that might interest you based on your search history and purchases. This behavioral targeting provides online users with a personalize and positive shopping experience. Based on Jeofrey Bean and Sean Van Tyne, authors of the book titled The Customer Experience Revolution “customer experience is the sum total of all interactions a person has with a company” and this interaction can be “direct with the company’s people or advertising messages”. This is where well customized digital signage software comes into place. 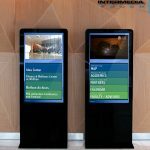 Digital signage software can be personalized to your unique business goals so you can provide an unmatched customer experience. Enhancing your customer experience is what separates Amazon from other online commerce company and you can also separate your business from your competitors by implementing a digital signage that is customized for the specific customer experience that you want to provide. What are some of the ways you are using to provide a great customer experience?